Oscar the Wonder Cat gets a teeth cleaning. Oscar had surgery two weeks ago to have his teeth cleaned and a few pulled. I promise you we're not hippie cat owners - apparently cat dental issues is all the rage at the vet office in the past few years. Everything went fine and he was back to eating dry food that night, even with stitches in his mouth. He's a brute, that one. As many of you know Oscar has always been an affectionate cat... so imagine our surprise when the surgery turned him into AN EVEN BIGGER SNUGGLER! And this is the craziest one. I was writing letters at the kitchen table yesterday afternoon and heard a crunching sound. 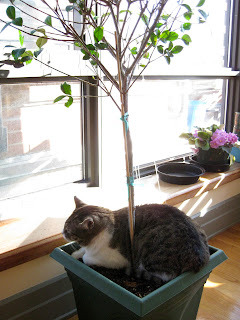 I turn around to find Oscar CLIMBING INTO THE GARDENIA TREE, crunching the leaves with his feet and settling in for a little nap. Maybe an attempt to get back to nature? Enjoy fall? What a funny guy. Memory Fridays: Looking Forward to Look Back. 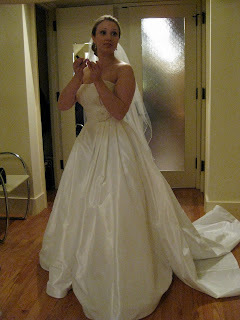 On Thanksgiving, I stole my mom's camera and uploaded the photos she's had on there since 2007 to a brand spanking new Flickr account. My mom has been photographing family events for over three years and has NEVER UPLOADED THEM TO THE COMPUTER. Holy scary, right? The memories captured on that 2.0 GB memory card ranged from the last visits with my Nana before she died to my brother's 20th birthday, to the trip my mom and sister took to Paris to visit me during my Master's program. As Katie and I looked through the Paris ones last night, we talked about how we looked. "That was my skinny year," I said. "Why were you so skinny?" "Never ate, just walked around Paris. Why were you so tan?" Pretty much sums up our 2006-07 years abroad right there. With a critical eye, I could tell just by looking at a picture what period of my life a photo was taken. My hair was very long when I lived in Greenpoint; I wore watches when I lived in France; I've had decent haircuts for all of 2010. I see those details and they mean something to me;they are vital details to the story of my life at the time. When I lived in Greenpoint, I didn't have money for haircuts because I was (finally!) living alone. When I lived in Paris, I had not yet encountered the stress of New York public transportation. It's only since I moved back a few years ago that I stopped wearing watches, because, who cares? The subway comes when the subway comes. I've had my hair cut every 6-8 weeks in a nice salon all year this year because I'm finally earning enough to do so. This Thanksgiving was the first time that Chris and I saw my family since we got engaged and there was a good amount of wedding talk and champagne drinking and browsing my parents' wedding album. Seeing photos of my parents with their friends and family has a familiar affect on me, like paging through old photo albums of my grandparents or uncles when they were growing up. I don't see the details; I'm too far removed. I don't see that some photos represent their "skinny year" or some photos put their favorite shirt on display, the one they saved up for and bought at a fancy boutique. When I look at old photos of my family, I see youth. And so in a way, that is really comforting to me. I imagine my grandchildren looking through my things one day, many years from now, when I'm old. "Look here she is when she was in France," they'll say. Or "look! Here's her first apartment with Grandpa." They will not notice my skinny years or my haircuts. The only thing they'll think will be: "Look how young she is here." And it will be true. And all of the self-critical moments one has in her life will melt away, invisible to the future generations. Because the inaccessibility of knowing a grandmother when she was young can only result in romanticism. And for that, I am eternally grateful. To my grandchildren, I will have always been young and pretty. And knowing that? It makes me feel young and pretty myself, at this moment, today. Even on the days I stuff myself with pumpkin pie. Happy Thanksgiving to anyone out there reading. I am thankful for my family and my friends and the people who read my blog. Also, for the way that imagining memories in the future can help you live your life more fully today. Last night as we were falling asleep, I was talking to Chris about time management. I mentioned that I was halfway done with my Christmas cards and that I was genuinely puzzled about how I was able to get that far ahead this year. "I mean, it's not like I'm not doing anything in my life," I said. "I guess my question is... what do people do with their time?" Rest assured I'm not trying to sing my own praises here, but rather wonder what I'm missing out on while I'm writing letters and holiday cards. "What do people do with their time? Watch me for five minutes," he said and then I laughed for half an hour. May you always be blessed with someone who can make you laugh out loud 3 minutes before you fall asleep, because it is the best thing ever and happens very regularly chez nous. This morning in the subway I thought about this again. I thought about how much sleep we got last night (9 hours... whoah) and how that must be a big factor in being able to muscle through the day. I'm constantly aware of the fact that having kids one day is going to throw a wrecking ball into life as we know it and I often wonder what we'll be able to accomplish with half the sleep we currently get. LDTT is a feeling that I get before I do most things in my life. Monday morning? LDTT. Organize addresses for our Save-the-Dates? LDTT. I suppose you could read it as attacking life (or being a crazy robot, whatever), but however you classify it, it's an amazingly efficient little jingle to keep in your mind. How did I become a LDTT person? I assume my efficient dad had something to do with it. Maybe being the oldest child is relevant too. And to be fair, I do have my days where I think "let's do this thing" and I have to get myself a chai tea latte or listen to some good music to get myself up to LDTT levels. But so far so good this Monday morning. I'm ready to attack my inbox, ready to set my 5 goals for the day, ready to start a 3-day work week. LDTT. P.S. The 9 hours really helped. It's honestly felt more like October than November this weekend. Blue skies, cool enough for a jacket but not too cold to walk around the neighborhood. Steve came to stay for the weekend and we had a great time eating bagels, taking walks and popping into newly opened restaurants and stores. I have no photos to share. You know it's a low-key, fun weekend when you haven't documented any of it outside of your memory bank. We're headed up to my parents' on Wednesday for Thanksgiving and I can't wait! This year, I'm lobbying to bring one of the desserts. Suddenly instead of feeling like I'm showing up for food with my boyfriend, it feels like our new mini-family should contribute something to the family feast. On a related note, this mini-family wants to feel healthier in the new year. This morning I asked the doorman if there are stairs in our building; we're now climbing the 8 flights up and down in an attempt to get some basic exercise in our daily routines. We're also going to make an effort to cook more together and learn some really awesome healthy recipes. What do you guys cook for dinner when you need a healthy night? And what simple things do you do to keep yourselves active (that do not relate to the treadmill)? Almost exactly two years ago, I took an important subway ride from work to the Petco in Union Square. There's a cat adoption agency that runs from inside that Petco and I went that evening with the intention of finally letting myself adopt a cat of my own. Newly in my own apartment with no one's allergies to worry about, I dreamed of adopting a male cat and calling him Oscar. Imagine my surprise when I walked in and met a male cat whose name was, already, Oscar. The sign said he was 4 or 5 years old and that suited me pretty well. Raising a kitten was intimidating. Any behavioral problems they might end up with would reflect my parenting skills. But here was a guy who had been around the block, who had been abandoned in the Bronx and still had a kind heart in him. He was a snuggler from the moment they opened his cage. Suddenly life was brighter. At any given moment, I had company at home. Oscar loved accompanying me to the bathroom in the middle of the night or the couch if I was watching TV or under the big comforter in the bedroom. 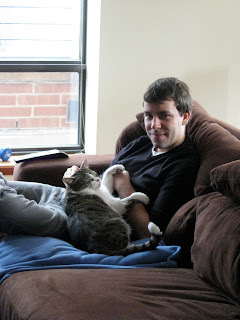 When Chris came over for our first date, we sat close to each other on the couch to watch a movie, but it was Oscar who snuggled between us, bridging the gap and taking advantage of 4 hands instead of 2 for ear-scratching and chin-rubbing. Needless to say, Oscar makes fast friends with everyone. This morning we took him to the vet to have minor surgery. He needed a few teeth pulled and had to be put under. It's been funny (and yet kind of alarming) to have him back tonight, as he stumbles around the apartment getting his bearings back. He's an incredibly social cat and tonight he's been off, wandering the apartment instead of keeping me company on the couch. 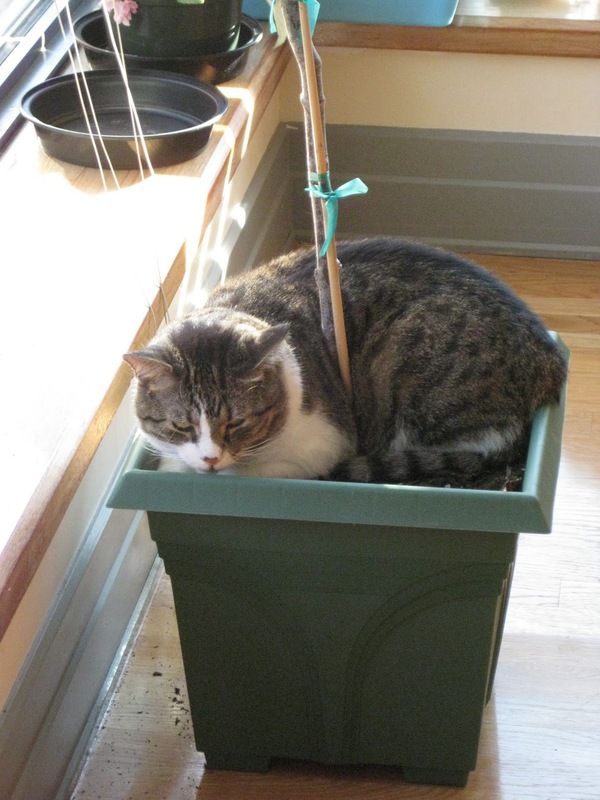 Sometimes I worry- what is going to break this cat's spirit? Will it be a vet's appointment? Surgery? Being shuffled to friends' apartments one too many times? My experience with my parents' cats is that they remember things like vet appointments, so much that they are afraid the next time the carrier comes out. Is it that Oscar doesn't remember? Or is there something else at play? I like to think that Oscar does remember that taking the carrier out means he might end up being prodded and poked. But at the same time, he also remembers how many snuggles we give him after an appointment or how we're always there to pick him up. He remembers that we come home every day, even though sometimes it's after dark. He remembers that we'll feed him in the morning if he lets us sleep to a reasonable hour. Oscar doesn't just recall the times he's felt alone or afraid. He also recalls the safest moments as well. 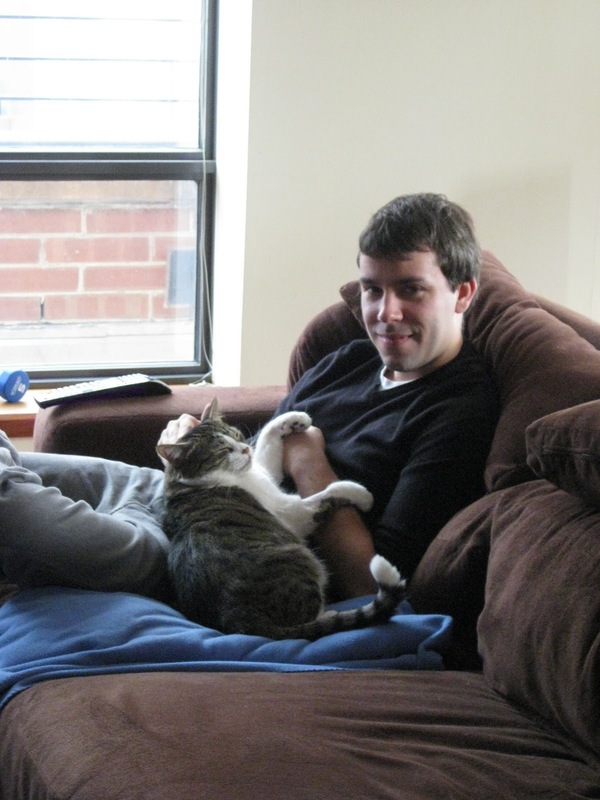 I'd like to think that Oscar's relaxed because of the vibes that Chris and I give off. And I'd also like to think that I'm more positive because of Oscar's willingness to get back on the horse (or into the carrier) every time, with no fear. He's a good little buddy and we're glad to have him back tonight. ... we're going to have a wedding! Holy crap! This is exciting! Tonight we had dinner guests from England, my friend Sarah and her boyfriend Andrew. Sarah and I were English Assistants at the same high school in Clermont back in 2003-04. We hadn't seen each other in three years and it was surreal to see her on this side of the ocean, eating chicken for dinner around the table in the apartment I live in with my fiance. When they left, I turned to Chris and made a face. "I miss having dinner with smart friends," I said. But it's not that. It's not the smart thing (although Sarah and Andrew are able to talk about politics and cultures and the like). It's the difference between inviting 40 people to our apartment for a party and 2 people for dinner. It's the way meeting one friend for brunch accomplishes more than meeting 10 friends for a drink. This feels like an influence of social media (blah blah, I know, but still). You broadcast news out to a larger audience and don't need to interact as much one-on-one. Here we are, nearly a month after we've been engaged, and I haven't yet seen (and hugged!) most of my girlfriends in New York. Isn't that kind of weird? I'm so glad the end of the year is coming. I love moments of renewal and setting goals and marking time by marking change. One of the things I'd like to work on in 2011 is having more personal friendships and acknowledging a social landscape that reflects reality. A few months ago I swore not to make plans til January and so far this is working out great. I still feel overwhelmed sometimes, but it's much better than having every night for a month planned out ahead of time. Evenings like tonight, roughly planned but fairly spontaneous too, prove that the plan to simplify the schedule was a pretty good move. Our lovely friends Chris and Britt got married this weekend and we were both in the wedding. It was beautiful and we had the best time. It's pretty amazing how just participating in someone's wedding brings you closer to them, their families and their friends. We both felt lots of love this weekend. I think the pictures speak for themselves. Also, I just have to add these. This morning we took Oscar to a new vet and he was so comfortable being there that he fell asleep on the examination table. If you're in the neighborhood, we totally recommend One Love Animal Hospital. They were incredibly nice and treated him so well. I was in the spring semester of my Master's degree in Paris when I stumbled on a blog called 185 Cranios Walk into a Bar. I can't remember how I encountered it, but it told the story of a young woman whose husband had been diagnosed with a brain tumor. Within 9 months, he was dead. I had just downloaded a bunch of songs from the Internet and as I started reading this blog, "Mad World" by Gary Jules started playing. I spent the rest of the day with that song on repeat, reading the blog from its beginning. I was scared out of my mind. Let's remember that I had just broken up with the man I was living with, the man I'd moved abroad to be with. Let's remember that I wasn't sure if I'd stay in France after defending my thesis (I didn't). Let's remember that I was simultaneously feeling a delicious freedom and a guilty conscience. What if I had just screwed up the best relationship I'd ever had? What if I had, once again, been unable to commit? And here comes this blog, this perfectly wonderful couple, whose lives are torn apart when he dies. Of a tumor. And left behind are a beautiful young wife and a little boy. I sobbed much of that day. And all the while, this Gary Jules song played in the background. I couldn't get myself to turn it off, as if the sad and slow melody was the company I needed while reading their unbelievable story. Relationships have blurry endings and you mourn over long swaths of time, sometimes in blips and sometimes in continuous confusion. I know that I spent that spring mourning the end of the relationship, but I don't remember much of it. My real memory of the end of that relationship was the day I read the brain blog and let myself cry for hours and hours. I can't hear "Mad World" without remembering that day, what it felt like to sit on my uncomfortable couch in my faded blue robe. I cried for Danna and I cried for Mike and I cried for the fact that I couldn't get my act together and the fear that I never would. If you would have asked me an hour ago what this week's Memory post would be, there is no way I'd say it would be about that blog or the end of that relationship. But that's the funny thing about music; from out of nowhere, a song comes on and you're transplanted back to a spring four years ago, to a chilly Parisian apartment, to a time when you were confused. And that's music's power. I'm sure you have songs that do the same for you. We all do. Maybe we should be thankful for these musical associations. After all, they keep us from living too far from our memories. They keep them right up front, recalled at any moment via iTunes or a juke box or the radio, an instant reminder of where we've come from and what we've lived through. Sometimes we need the reminders. I spent my subway ride this morning reading two hand-written letters. When Sima moved to California and Fanny moved to London this summer, I proposed writing letters to each of them. We've found a steady rhythm and a steady format: each letter starts with some responses to the last letter or news about what's going on where we are. Then the person answers the 5 questions I sent in the previous letter. And finally, they pose 5 questions to me for the next letter. Does that sound complicated? It isn't. Hey! Let me respond to your 5 questions. Here are 5 questions for YOU! Sima and Fanny don't know each other, but I loved reading their letters back to back this morning. On the one hand, you have someone who continues to work remotely for the same company in sunny California, who left New York after living here her whole life. On the other, you have someone who is starting a Master's program in London, who left New York after living here for a good chunk of her 20s. More different they could not be. And yet I find some of their thoughts about being in a new place or anxieties about finding their way very, very similar. Can I also mention that writing these letters has kept me close to them in a way that email or calling or blog posting could never do? The act of sitting down to write, to put pen to paper and mull over words and thoughts, is something so quiet that you just feel the superficiality of some friendships (hey! how are you? fine, and you? great!) melt away. I've had more in-depth thinking via letters with these two ladies since the summer than I've had with some of my best New York friends in the past year. I cherish the days I have a letter waiting for me, but I adore the subway rides the next morning. I open the letters before leaving my apartment and force myself not to read them until I'm in the subway car. I love spending my relatively short commute lost in the sun-filled days of Sima's life or in a Starbucks with Fanny in chilly London as she completes her homework and writes to me. It's this that I need, when my life centers around work. These short moments during a morning commute to connect with the heart and soul of a good friend. No better way to start the day. We've received some very sweet cards over the past two weeks for our engagement, but the coolest thing was the package we got yesterday. It was from my dear friend Jess Farris who went to Muhlenberg with me. I present for your amusement this sunny Saturday... 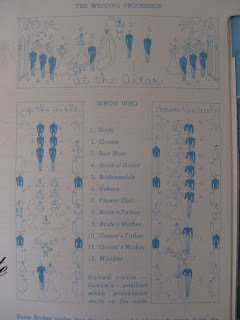 The Bride's Notebook! Jess found this gem in a thrift store last week. 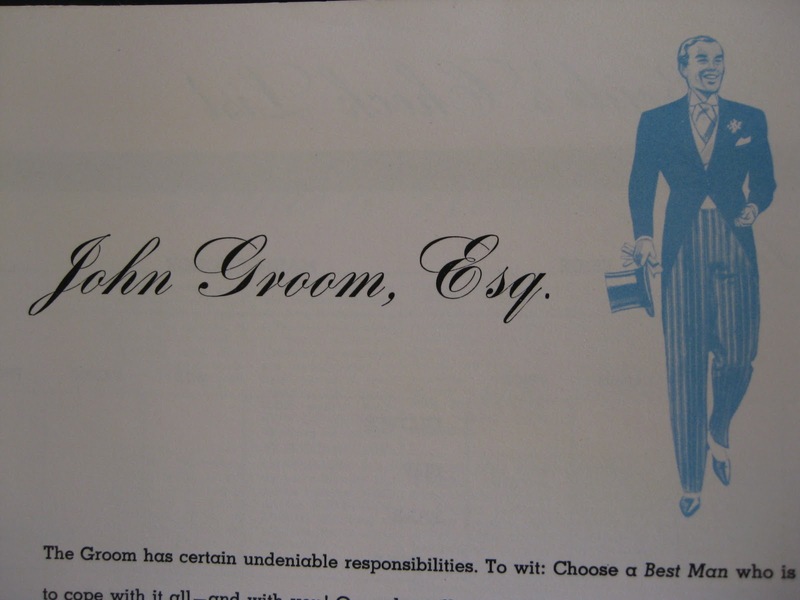 It was originally published in 1941, but we think this version is from 1950. Chris and I have been trying to find a venue that's not booked over a year in advance. Yes, I agree it is insane and yes, I lose sleep at night wonder whose backyard we could hijack for a day. But people in the 50s didn't have to worry about this. They probably slept just fine. 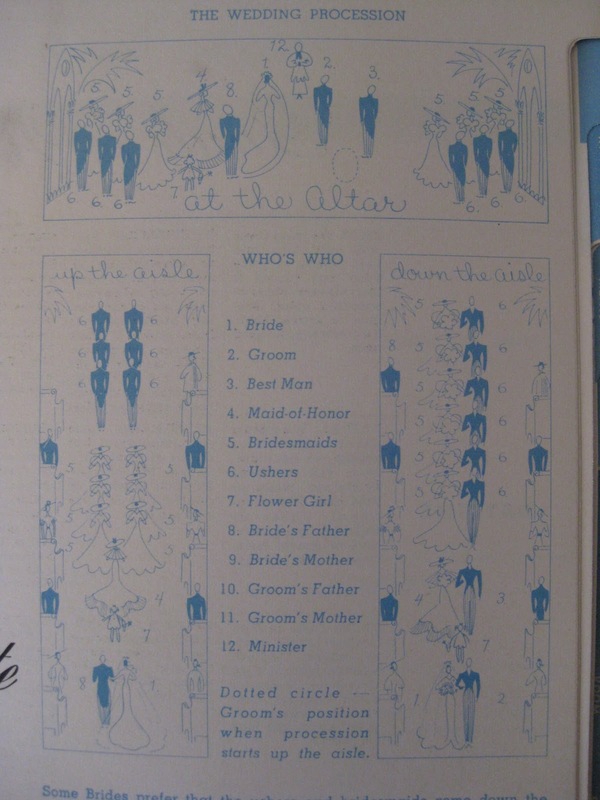 Also, what if you needed a diagram to show you the order of how people walk down the aisle? What do you do in the 50s without the Internet?? Here's what. 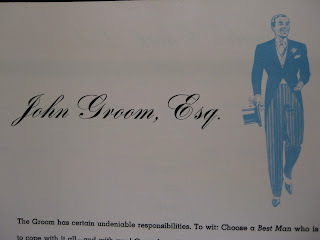 Hey look, it's John Groom, Esq.! 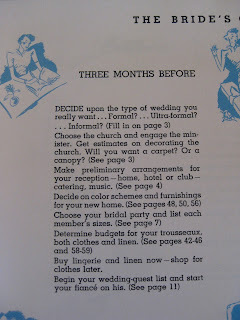 Also, I love how weddings in the old days required you to set up your life, like, immediately. Here's an informative page about buying a wardrobe full of color-coordinated clothes. AS IF YOU WENT AROUND NAKED BEFORE THIS. And obviously, always make sure you have negligees on hand. Memory Fridays: Kindness is a superpower. I entered the 9th grade as I have entered every next step in my life: without older siblings. I had no big brother to drive me around or big sister whose friends might have let me squeeze into the backseat after school. When it came to ambling off towards the great unknown, I was on my own. And lest that sound tremendously exciting, let me clear one thing up: I was a tiny little fish, and I believed I was a tiny little fish. Later in my life I realized that untrodden territory was to be relished, but I had not yet reached that point in adolescence. I walked down the block alone on my first day of 9th grade, the pre-7am air chilly. I waited at the bus stop and when we arrived at school, everyone was very tall. I remember feeling like a loser. Gym, in particular, was a painful place to be. The stylish gym clothes of 40 girls was further proof that I was living as a dork. Some of the girls in my grade were already wearing Victoria's Secret. To add insult to injury, we had mixed gym with the 10th grader girls. Reading about memory reveals that our memories make a large part of our identity. But that doesn't just mean glimpses of the seashore or the French countryside. What experiences do we remember? And how can we map these experiences to who we have become? The life I led until one day in gym class in the 9th grade had identified me as a fairly happy, good student at school. But I didn't have social confidence and I hated that the power (and thus, confidence) lived in a small group of popular to-be cheerleaders. Then one day, a 10th grader named Lisa Manganelli changed all that for me. I can't remember how we knew the Manganelli family. Lisa was a year older than me and she had a sister in my sister's grade. I think our moms knew each other. What I'm saying is, when Lisa and I were in the same gym class, I already knew who she was. She was on the volleyball team and wasn't one of the popular cheerleaders. She had really long stunning Italian black hair and a great laugh. Why do I remember this? Because I thought she was lucky to be confident enough to laugh that loud and free. It was the first day of a volleyball unit in gym and the teacher chose several girls to be captains. I assumed I would be one of the last ones on the wooden bleacher, finally picked because someone needed an alternate. That that would be my role in the volleyball unit, since that had been my social role at school since forever and ever. Lisa Manganelli was a team captain. It was her turn to choose a first player. And for whatever reason, Lisa Manganelli chose me. Can I reiterate that I have never been an athlete? That I was not popular? That I was embarrassed of my gym clothes? Can I tell you what kind of awe I felt jumping down from the bleacher and taking my place behind Lisa Manganelli, shyly high-fiving her when prompted? I could not believe she'd spent her first pick on me. I knew it was a pity pick, but that almost made it more meaningful. I was flooded with respect, Lisa Manganelli, our generation's Mother Teresa! I barely knew her and yet she had chosen me, demonstrated a kind gesture in our high school. Suddenly I had a role model for being kind, one who was pretty and athletic and not entirely unpopular. "I will be like Lisa Manganelli!" I thought, smiling a little broader in the hallways and with a core confidence that I had never felt. I decided to be friendly and pull my confidence from a reserve deeper within me, rather than reaching for social clout. Who am I today? I'm someone who likes making people comfortable. I'm someone who has taken that tiny reserve deep within me and grown it to be a large pool, deep and wide. Over the years, that reserve has grown by helping other people and finding inspiration from others who are confident and kind. In many scenarios, I'm still a tiny fish. But the difference is that I never believe I'm a tiny fish anymore. I know that I have it in me to be a big fish, a confident fish, and that starting out tiny is just a step on your way to becoming big. So thanks, Lisa Manganelli. Thank you for being kind one day in gym class. Obviously I never forgot it and obviously in a not-so-small way, the memory of it made me who I am today. Wow, right? This explains so much. This is why it's so heartbreaking to spend time with someone you know who has Alzheimer's or dementia. They look like themselves. Their genetics trick us into believing they are still the same person. After all, people who lose their memories do not lose their physical identity. But without these memories, they're only half themselves.